Google's CS First is a free online computer science and coding curriculum for students in upper elementary and middle school (ages 9-14). Lessons and activities are designed to be engaging and relevant, with themes such as Storytelling, Art, Sports, Fashion Design, Social Media and Animation. It is also designed in such a way as to make it easily adaptable to a wide range of settings with learning materials that are clear, detailed, user-friendly and visually appealing. 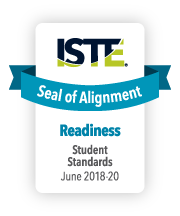 The Google CS First curriculum successfully underwent the International Society for Technology in Education (ISTE) Seal of Alignment review for Readiness. Reviewers determined that this resource helps build foundational technology skills needed to support the ISTE Standards for Students. Google’s CS First website provides a rich and deep set of resources designed to support computer science learning activities for formal and informal, in-school and after school programs.